Oh-ho-kayyy Mr. Kim, big words. Let’s see what you’ve got, then. What is it, man? BiBiGo is a fast food restaurant (and for now, a pilot testbed of sorts, in Gwanghwamun and Mapo-dong) focusing on bibimbap. Surrounding that, the company has thrown out a lot of terms to describe it. The sign out front says, “Bibigo Hot Stone,” and the inside signage says, “Korean Healthy Fresh Kitchen.” I’m sure the rest of the copy slightly differs elsewhere, but I don’t remember what it is. Needless to say, it’s something to do with fast, bibimbap, rice, Korean, healthy, or fast rice. Okay, so it makes a ton of sense to us locals who are numb to Engrish, but probably not as apparent to anyone else. And what it is, at least on the first floor, is Korean fast food. Your dish can be ordered and ready to eat within a minute or two. And food, yeah I guess it is food. That’s why we’re here. The ordering process seems simple. The menu and ordering flow have been lifted from Chipotle. 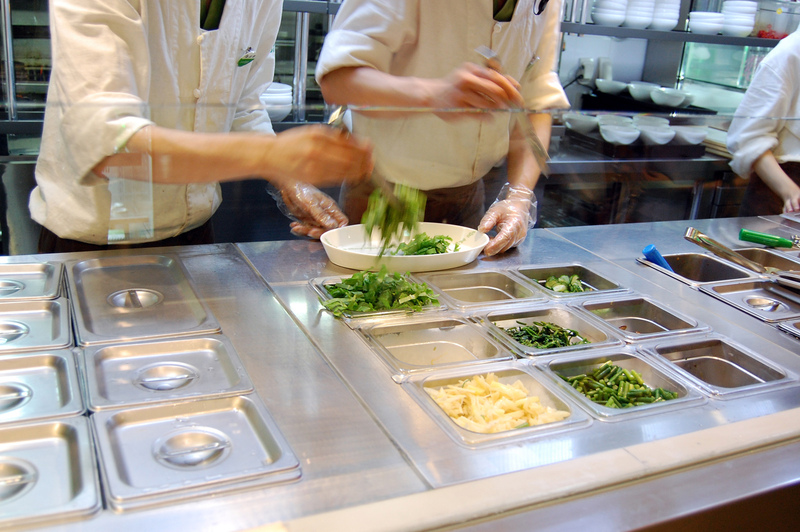 You start at a glass-partitioned counter that houses a hot/cold line, manned by two or three people. You order one of three basic form factors: Bibimbap, Dolsot Bibimbap or “Bibigo Rice”–essentially Bibimbap that you don’t bibyuh (mix), which seems a little silly, but whatever. Just like Chipotle, you choose your dish then choose from a number of carbs–white rice, brown rice, black rice or barley. Then they add namul and then your choice of protein (beef bulgogi, grilled chicken breast or tofu). 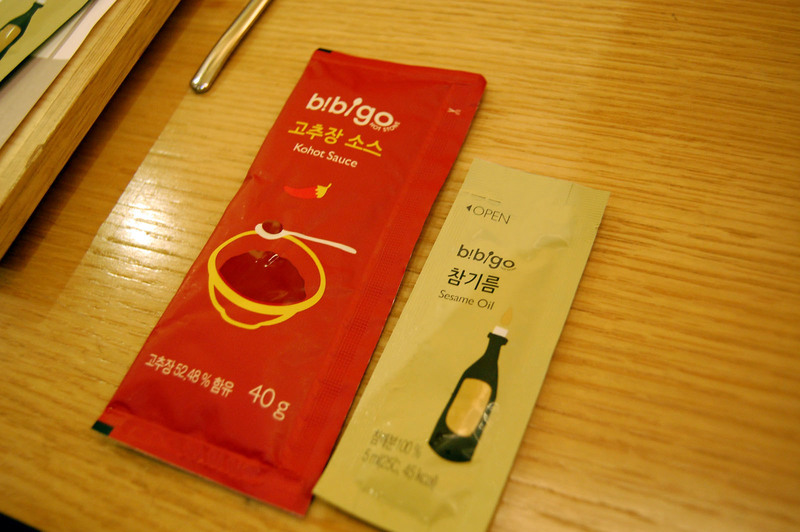 Choose from one of their three pre-packaged 40g sauce packets, from “Kohot” + a small packet of sesame oil (essentially a bibimjang, or gochujang, to those less serious about bibimbap) to Citron (that’s yuzu, to foodie types) and soy-based sauces. One thing that is confusing–their namul section on the line (the cold bar, after dishing up the grain) is filled with 9 or 12 veggie varieties, some which look pretty tasty. Yet while I believe Koreans are able to customize their own bowls, the staff do not go out of their way to offer foreigners a choice of their six namul toppings. And describing them in English would be beyond their means, as well as mine. They’ve got some blanched cucumbers in there (oi saengchae), some garlic stems (maneul jjong), some doraji, shiraegi, cham namul reconstituted from dehydrated state, some shredded romaine lettuce, sauteed Shiitake mushrooms (pyogo beoseot bokkeum? 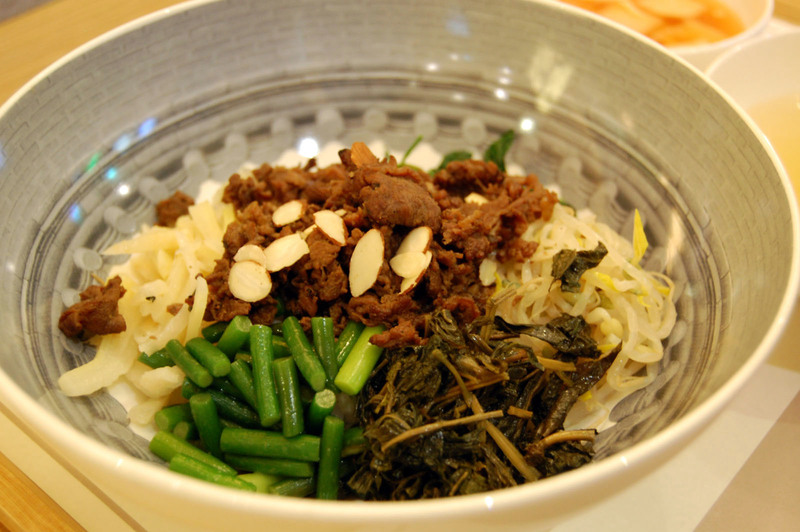 ), some mung bean sprout namul (not to be confused with the more commonly used kongnamul soy bean sprouts) and a fairly conventional spinach namul. It’s a fairly simple dish that is unfortunately one of the hardest to describe with any clarity in English. You may add some additional hot and cold Korean food plates, mysteriously called “Korean Tapas,” including bulgogi, japchae, mandu (three pieces of fried dumplings for W6,000). You can chose drinks from a chilled cabinet by the door that houses Vitamin Waters, Perrier, Coke, Dr. Pepper and some Japanese bottled teas, at prices one expects for those beverages anywhere else–about W2-3,000 each. On the second floor, there is full-service restaurant that has more on the ‘Korean Tapas’ menu, serves some alcohol and offers the bibimbap as a “bansang,” which is jeongsik–a full special platter with more accoutrements than the bibimbap + small bowl of kimchi + bean sprout broth. And that, too, is just as it is described. It’s a full service version of the same thing with a proper waiter to take your order of what the plebes downstairs are having to order for themselves. Fast/Slow? Cheap(er?)/Expensive? They’re vying for two concepts here in the same space. So how did it fare, the fare? I have tried both the downstairs “fast” version and the upstairs “full service” versions on several occasions. As many people will be quick to point out, there are no eggs in this bibimbap, and everything has a definite “health” and “natural” bent here. 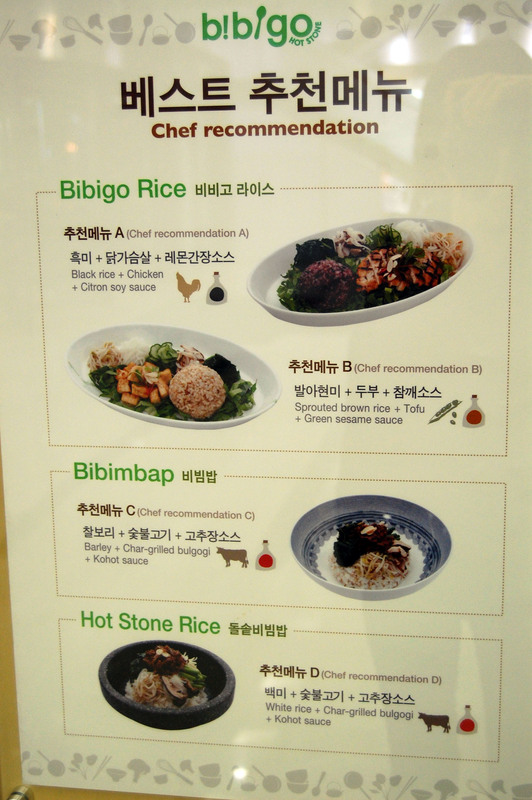 On the first floor, Bibigo Rice and Bibimbap are W7,500, and Dolsot Bibimbap is W8,000. Sides are Nabak Kimchi and a Kongnamul-guk that is fairly tasteless. If you get the second floor’s Bibimbap Bansang you get the aforementioned with an additional two small sides that are fairly insignificant and, I imagine, are rotated periodically, and a smartly-wrapped small parcel of ssam greens with a little ssamjang paste (and you know, if anybody is listening, this as a business concept on its own has legs). In place of Kongnamul-guk in the Bansang, you get a clam-based Doenjang-guk (soybean paste soup) with a little more to it than the typical Korean fast food joint doenjang-guk from a water decanter. To add this stuff, it’s W13,000 for the Bibimbap Bansang upstairs. Taste is… well, I’ll be honest here, it’s not offensive, and the food tastes fresh, but it’s bland. As it were, bibimbap is a fairly healthy dish already, is it not? Well, they probably have made it a bit healthier here somehow, if by way of eliminating the egg. But if you’ve eaten enough bibimbap in your lifetime I think that you’d find it a little boring. A monk may find it spicy and exciting, but this reviewer thinks it needs a bit of kick. The “Kohot” sauce (presumably an obvious portmanteau of either “Korean” or “Kochujang” and “hot”) comes in a generous, fairly hefty 40g packet with the additional sesame seed oil, but it’s either been toned down to very mild levels or is just not enough in volume for me to really get my Bibigo well-slathered with a bit of spice. I suspect it’s the former as this place has those aspirational aims of becoming global–and you know, nobody in other countries eats spicy food. The “Korean Tapas” (I’m cringing here) were flat out bad. Just as with the Kohot sauce, authentic Korean flavors have given way to extremely diluted sauces and marinades. The “Silver Noodles” (W11,000) is a plate of japchae dangmyeon noodles, some green and red pepper strings, and two roughly trimmed stalks of grilled asparagus, which were a little too proudly placed to be merely a garnish. But the japchae is missing the tasty sweet soy sauce and scallion-based yangnyeomjang sauce that makes japchae, well, japchae. It was just noodles with some peppers and two asparagus stalks. If anyone has W11,000 burning a hole in their pocket, they can go to down to Bibigo and see if I’m not lying. Other “Korean Tapas” dishes were similarly underwhelming, and frankly, at W18,000 for 250g (that’s about a half pound uncooked weight) of bulgogi, or W6,000 for exactly three tofu and chive mandu dumplings, I can see some people even getting at least a little frustrated at the prices here. That’s Korean people and the foreigners they hope to attract, alike. It’s too expensive… for too little food… that doesn’t even taste like much. Okay, so that would be enough of a review for most places, and if it were a small one-off mom-and-pop joint, I’d give them a little credit for something. But then again, most small restaurants aren’t bankrolled by a chaebol mega-conglomerate as an experiment, and they don’t fill their “Coming Soon” window signs with words like “Global Korean Food Culture Project #1” or run through a laundry list of fashionable world cities, like New York, London, Paris, Singapore. That’s pretty glamorous sounding for a restaurant specializing in a rice and vegetable dish traditionally made from leftover bits and pieces in your fridge. I mean, this is highly aspirational stuff, and Korea is the land of high aspirations these days. We know now that the food is pretty “diet” and hits pretty weakly. Does it have what it takes to make it elsewhere? For such a simple idea as fast bibimbap, Bibigo is clearly a product of too many chefs and a case of corporate stone soup. It seems like a project that they brought into the office one morning and let everyone chip in their ideas–and they actually used them. Presumably the whole project was wrapped up after a keyword brainstorming session about an hour before lunch, while everyone was hungry. This is not a restaurant made by people who love food or care to know more about it. This is a restaurant made as a side project by a huge company with bottomless pockets and a bunch of salaried people who were probably well pleased with themselves when they got to pitch words “Ko-hot,” “Korean Tapas,” “Well-BING,” “hot stone,” “Thin Thin Squash”* (? ), “Silver Noodles” (aka Japchae), “White Fish Carpaccio” (highly aspirational stuff, like I said) and the list goes on. One look at the menu, and you can see they’re throwing punches every which way and not landing any of them. That look at the menu will also tell you that for a so-called “Global Korean Food Culture Project #1,” nobody really cared to put anything into sensical English. Whoever was signing off on this stuff probably cared very little. While I am aware that CJ ran some focus groups with local ESL teachers and the like, asking their opinions, it’s probably clear that they ignored everything that they paid for in those marketing research sessions (and I’ve worked in Korean marketing research before, and can paint a pretty clear picture of all of this in my head, sadly). Do they really think non-aficionados of Korean food will have any clue what this stuff is? And really, that is just downright insulting. It reeks of traditional and misguided stereotypes Koreans have of foreigners eating their food, from 40 years ago or more, and that just isn’t the same now. All of those calculated bulgogi+japchae+rice+kimchi “welcome” dinners I was served by well-meaning Korean hosts years ago came with good intentions, but they were a little old fashioned. Don’t dumb down your food. Be inventive. Improve. But taking what exists then taking some away because you haven’t even bothered to learn your market without adding anything more, that is some weak sauce, literally. If anything, CJ should be taking hints from contemporary people like David Chang (Momofuku) or Roy Choi (Kogi and Chego). In the case of the latter, he’s not making his food milder. He’s making serrano pepper gochujang. And both serve up cheaper food than Bibigo. Let’s see, do you want David Chang’s $20 daily prix fixe at the Ssäm bar, or do you want W30,000 worth of Bibigo? As always, Koreans have no concept of the word “vegetarian” as it is known in the Western world. With Bibigo, they’re 98% of the way there. Unfortunately, they’re falling on their faces about two feet from the finish line. Nabak kimchi in place of garden-variety baechu kimchi (which features a seafood component for fermentation). Tofu as a prominent protein choice. We’re full-on vegan at this point. Among Asian foods, that is truly amazing. But then things lose their way. 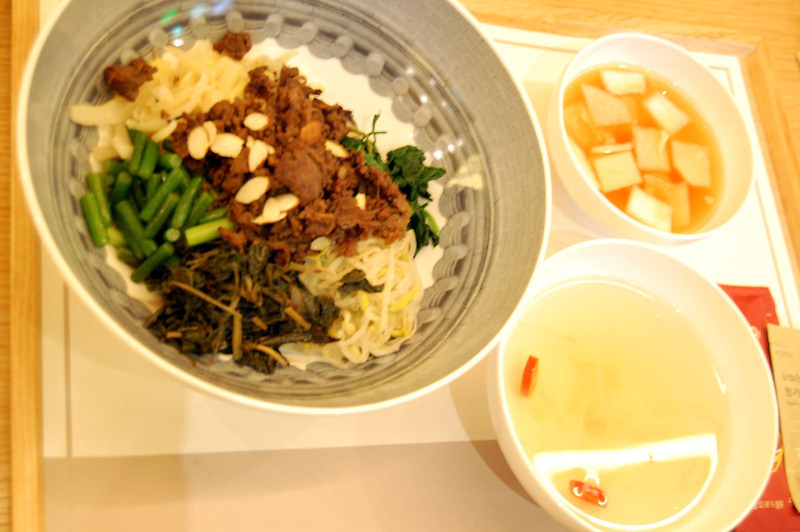 The Doenjang-guk gets a clam broth, the Kongnammul-guk may get a slight meat flavoring. We have no assurance, if any, whether the sauteed namul has been sauteed in meat stock, as it can be. The “Kohot sauce” even mentions on the packet label that it was made in a processing factory that also handles meat, seafood and gluten products, but this is only written in Korean. So, overall, huge missed point there, and that could have been a huge one for them. As bad as “Korean Tapas” is, you could maybe describe bibimbap to the uninitiated as being a “Korean rice salad.” In terms of how people eat overseas now, that wouldn’t be far off. Nobody wants to pay $20-25 for that, and that’s about what I paid last night–for two bowls of bibimbap and two Japanese-branded teas. I realize food prices are going up globally, but Bibigo is not sophisticated nor is it hearty and satisfying to anyone but a 100-pound Asian girl. So it’s going to find a hard time fitting in when they move abroad. I’ll pay a thousand bucks for a dinner for two if the cooking was up to it, but I honestly feel really insulted to have to carry my own $10 tray of rice and pseudo-wild veggie bowl and have to find an empty table in a busy restaurant, to be greeted by the water/soup girl, and not leave the restaurant feeling satisfied. To get full American family restaurant-style on Bibigo food I think you could breach $50 for one or two people easily. That doesn’t sound like fast food. You can get Michelin-starred lunches in other global cities for that much. I’m not sure how CJ Foodville will be able to address things like having one or a small number of restaurants in these global cities and be able to bring Korean-specific groceries to the table. Things like garlic stems are regarded as early-summer/late spring seasonal things in America. Fresh doraji isn’t widely grown. In America, the land of waxy year-round produce, surely an undertaking like this can’t be cheap, can it? If there were any real positives to add here, I could say the restaurant is clean, and service and product are fairly tight and consistent, albeit confusing. On the first floor, you have people on the dining room floor to bring you your hot soup separately after finding your own seat. You get water glasses and ice for beverages brought to you separately, as well as flatware. It’s half serviced and half not. It’s awkward, to say the least. A few of the staff seem a little lost and wandering. This is a Korean fast food restaurant, after all. Decor is fairly normal, but in my opinion, not attractive. Decorations consist of swathing the entire place in laser-cut Korean lattice on satin birch, some small colored boards in a soft Korean palette, like pictures on a display runner (yes, I’m serious, go check it out). And then there are the “design points” on the far wall–three huge wall-sized prints of stylized vegetables, bearing down on you as you eat, in this temple of veggies. Yes, it’s clean, but really, shouldn’t this restaurant be clean? I’m glad that they’re not out on the sidewalk washing cabbage in a huge trough with a garden hose and then laying them out to dry on the same sidewalk or parking lot. But you know, come on, these are the basics, and they’ve got plenty of money while charging plenty of it. It’s just as basic as using English/foreign language copy that reads well enough for people in these various countries CJ aspires to do business in. If you put a hygienic restaurant in an office-heavy neighborhood in Seoul, promote “health,” be new to the market and have something that can resemble a meal for between W5,000 to W10,000 in Korea, you will automatically be full of customers for lunch and dinner, 75% of whom are Korean women who are in that category of 100-pound Asian girls who get full off an approximately 400g bowl of rice and tiny vegetables with trace protein. 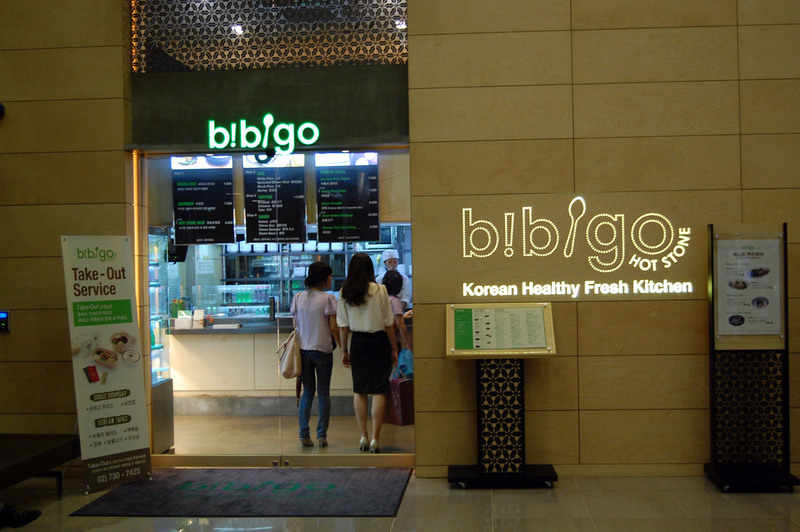 It makes Bibigo look like a success, which it is to an extent–in the two stores it has in Korea. But the person who did not have the foresight to see that it’s not going to be this way in the western countries that Bibigo wants to expand to made a pretty lazy mistake. The whole thing is like going to an ice breaker party and only talking to the few people you already knew. The world is good and ready for a “Global Korean food culture project,” but not in this way. Not with Bibigo. * Yeah, this is on the menu. It’s actually a sweet rice flour (mochiko, foodies) and Kabocha squash jeon pancake. Drew is a designer and has been living in Korea on and off (mostly on) for the past 10 years. He lives in Seoul with his beagle and spends far too much on food and drinks. There is also a lot of confusion out there about its American location. The new official Bibigo opened on September 6th in Los Angeles. A “Sobahn Express” had opened at an H-Mart food court in Irvine California, changed its name to “Bibigo,” then changed it back to Sobahn. There are some positive reviews of the place, but a good many “blah” reviews stick out along the lines of it being bland and pricey for what you get. And this concept of having diners carry heavy sizzling and boiling stone bowls is inviting good ole American lawsuits. I’m sure McDonald’s is facepalming itself, careful not to spill coffee in its lap. There are also some restaurants in the U.S. that already do the Chipotle-as-Bibimbap concept with positive buzz, such as Rice Bar in D.C. and b-bap in New York. My photos are way better… hahaha.